Though Mabor, Cavelossim, and the next three beaches are really a single strand, they are treated as separate beaches because of the villages they were once associated with. Thus the next one north, Varca, may in time develop a character of its own. For the present, it s really an extension of the others. It does, however, have deep rows of casuarinas and is long, clean, and quite lonely. It is possible to find rooms to rent in family houses by asking around the village. Facilities are ultra basic, but if is looking for somewhere authentically Goan, yet not too far off track, Varca is worth considering. A bicycle and cooking equipment are essential for long spells. 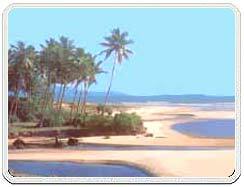 A Scenic Beach Varca is one of the most picturesque beaches of Goa. With fewer tourists and a serene ambience, the unadulterated beauty of nature can be realised from close quarters at Varca. Varca is an invitation to painters and photographers to capture its beauty in the canvas and the lenses. Varca offers the tourist the option of opting for relaxing and rejuvenating activities like sun bathing and massaging. 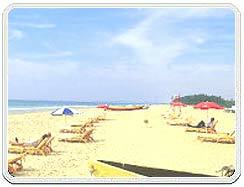 An attraction of the beach is the arrangement of boat trips for willing tourists in the seas. Another major attraction is spotting dolphins jumping and playing in the seas. The Food Joints Seafood is Goa's staple and Goans do not believe in discriminating against tourists when it comes to serving their staple. As is the case with other beaches, Varca beach is also full of food joints serving tempting seafood. Wine being an integral part of the Goan lifestyle, the tourist is also bestowed the privilege of tasting the finest of Goan wines. For those who love good food , great sights and serenity, Varca is the right place to be in!